If you’re looking for an alternative to expensive razor blades or cartridges, the best women’s electric razors are a great choice! They trim and shave hair more closely than traditional razor blades, which helps reduce irritation, razor burn, and ingrown hairs. Using an electric razor may even allow you to go longer between shaving sessions, which also saves money! Before we dive into the product reviews, here are a few features to think about before buying a new electric razor. Power: Depending on your needs, we found both corded and cordless options for you! Corded razors can be used for extended periods without needing to be charged. Cordless razors can go anywhere, making them convenient to use anywhere around the house. 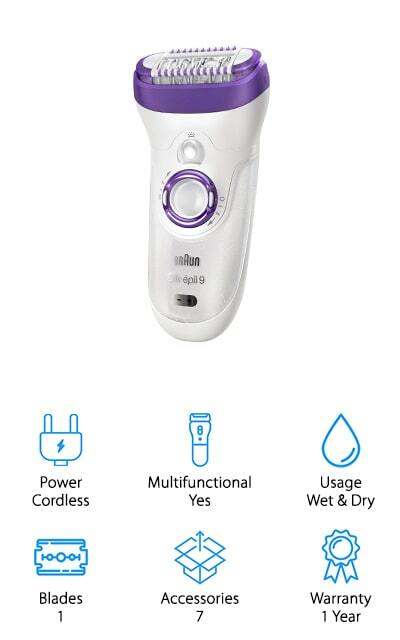 Multifunctional: Multifunctional women’s electric razors are built to work all over the body, including your legs, armpits, bikini area, and more! Many of the electric razors we reviewed here today have special settings or attachments to contour to each area comfortably. 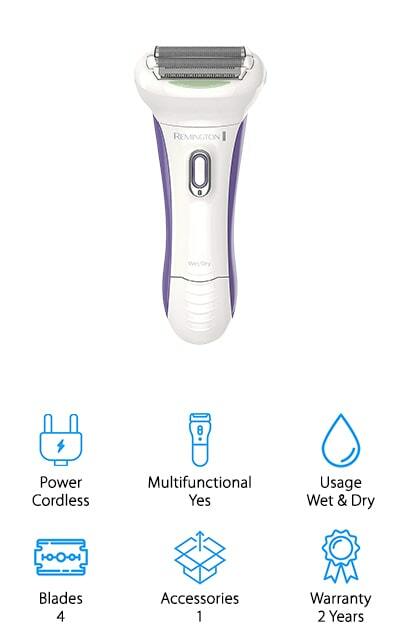 Usage: We also tell you if each women’s electric razor can be used in wet or dry conditions, or if they work in both. This gives you the freedom to choose whichever methods you prefer to get a close, comfortable shave. Blades: When possible, we’ll also say how many blades each razor has, or if they have alternative shaving heads. More blades mean closer shaves, even with coarse or thick hair, while fewer blades work on thin or easy to shave areas. Accessories: Some of the electric razors we reviewed come with just the razor and charging cables. Other razors we reviewed come with a variety of fun accessories, including special razor blade heads for smaller areas, clipper guards, storage solutions, and more! Warranty: When investing in beauty tools that should last a lifetime, a warranty is a great assurance to the customer in case their razor doesn’t make it a lifetime! Companies will offer to repair, replace, or refund if things go wrong! Now that you know more about the cool features that women’s electric razors offer, let’s find you the best razor for your needs! Whether you want the best bikini electric shaver or an all-in-one shaver for your whole body, we found 10 great options for everyone! If you don’t have time to read about all 10 right now, no worries! Start off by reading the Top Pick and Budget Pick, and you can come back later to read the rest! 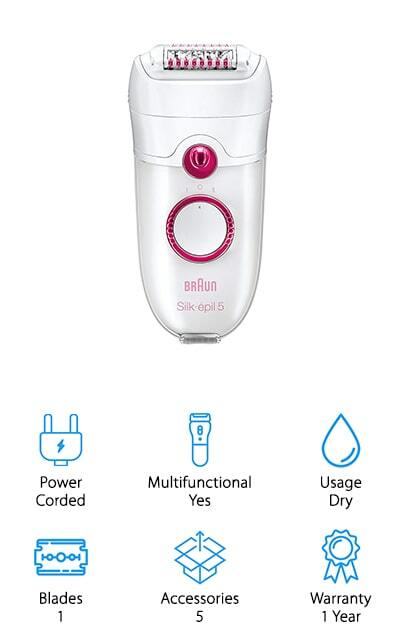 Our pick for the best women’s electric razor goes to this versatile razor kit from Braun! We like that this cordless razor has a wide head, which allows you to remove more hair with each swipe. This is great because it reduces the amount of time you spend on hair removal each time! It also gently pulses and vibrates to reduce discomfort and irritation, which is great for beginners! We also like that this razor can be used in both wet and dry conditions, so you can take it wherever is most convenient for you. The kit comes with several head attachments to use all over your body, from legs to armpits, bikini area, and more! 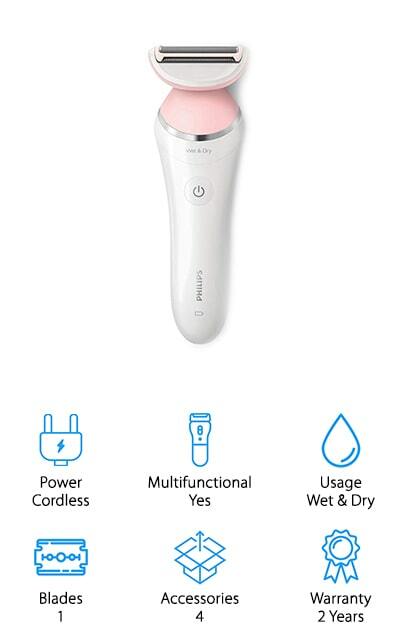 It even comes with a bonus electric face brush you can use to cleanse and gently exfoliate your skin for a full spa experience! This razor topped our list because it comes with everything you need to keep your skin feeling smooth and clean! When we were looking for the best cheap electric shaver, we wanted to make sure you wouldn’t sacrifice quality for cost. We were pleasantly surprised to find that Panasonic, a company known for making expensive, high-end beauty products, makes an inexpensive electric shaver that also works really well! This cordless shaver can be used in wet and dry conditions, so it’s great for taking in the shower or using in a hurry before running out the door. The 3 blades float comfortably around your body’s curves to prevent nicks and ensure you don’t miss a single hair. It also has a pop-up trimmer that you can use for long hair or trim around your bikini area. The blades are all hypoallergenic and super sharp, so you can use this even if you have sensitive skin! We think that this is the best cheap electric razor because it has the quality of a high-end razor without the high-end price tag! Instead of buying a separate electric shave and facial brush, why not buy one product that can do both? 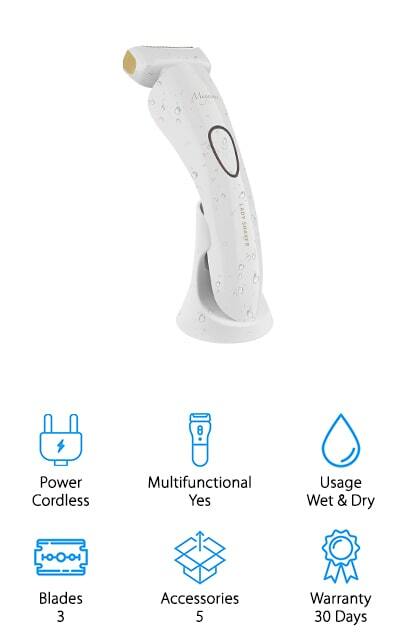 This electric shaver kit from ETEREAUTY comes with everything you need to take care of your face and body! This kit comes with 4 different razor heads: a general shaving head, precise shaving head, precise trimmer head, and a face cleaning brush. All you do is pop on the attachment you need and go! The rechargeable base is easy to use and hold securely as you shave. We also like that you can use this in wet and dry conditions, so it’s perfect for taking in the shower or using wherever you’re comfortable. The various trimmers work all over your body, including legs, armpits, arms, bikini area, and wherever else you need to remove unwanted hair! We also like the face brush head for gently exfoliating and cleansing the skin, removing dirt and oil from pores for a clean, fresh face! Next up is another electric razor from the same company that makes our Top Pick! Braun’s Silk-épil 5 Power Razor is great for both beginner and experienced users alike! We like that it’s small and easy to fit in your hand, and the head pivots to give you more control while working around curves and awkward areas. It also creates a vibrating massage while it runs to help prevent irritation, which is nice! We like that this razor can remove hair that’s only 0.5mm thick, and it comes with a bright light to help you see better, which means fewer missed hairs overall! It comes with 3 different guards for various needs, and it also comes with a cooling glove that helps soothe irritated skin after shaving. It’s also a corded shaver, so no worries about charging batteries or limited runtime – if it’s plugged in, it’ll run! This is a great shaver for people new to electric shaving tools! 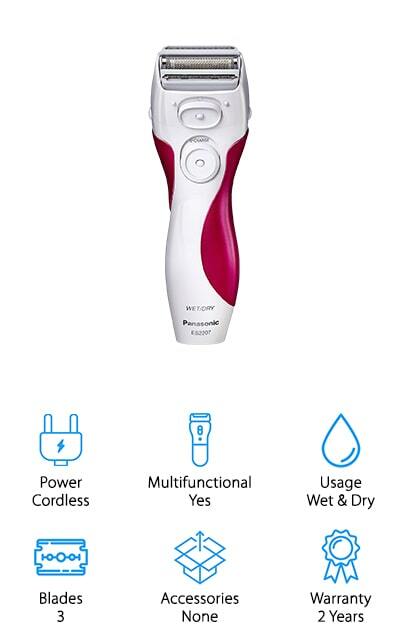 If you’re looking for the best ladies electric razor without a bunch of extra gadgets and guards, this kit from Remington will get the job done without taking up extra space in your bathroom! It comes with the shaver, a bikini guard, and a charging tower – that’s it! No need to store a bag full of specialized tools and cables! We like that the 4-blade shaver head works well to pull up even the shortest hairs without irritation, and gives you smooth skin for up to 4 weeks. The angled head stays close to the skin, and the double-sided trimmer grabs longer hair to prevent excessive pulling or ingrown hairs. We also like the almond oil strip as an added touch of moisturizing and comfort. You can also use this in both wet and dry conditions, so you can use it wherever and whenever you’re comfortable! A great option for women who want a clean shave without all the fuss! Another well-known brand in hair trimmers is Sminiker, who is known for making professional quality products for home use, salons, and barbershops! Their electric razor is one of our favorites for the best electric razor for bikini area maintenance. We like that this razor comes with 3 different blade options: a large razor for legs or arms, a precise shaving blade for underarms and smaller areas, and an even smaller precision trimming blade that’s made especially for the bikini area. It also comes with trimming guides for longer hair, a facial brush head, and a 7-piece manicure set for detail work! It’s a great cordless trimmer that can be used wet or dry, and it’s easy to clean the razor heads after every use to prevent irritation or bacteria buildup. 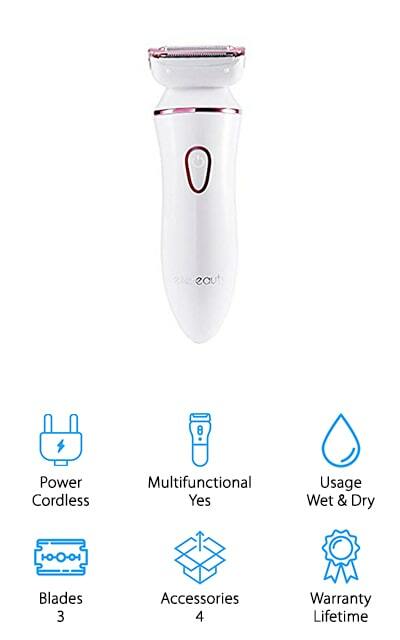 We think this is a great, all-inclusive electric shaver that’s inexpensive enough that you could get one for you, and a few to give to friends or family as gifts! If you’re looking for the best female electric razor to take on the road, this 3-in-1-blade razor from Megainvo is a great option! This inexpensive razor doesn’t use a variety of removable heads or guards to do all your body shaving. The razor head has a curved blade for tough to reach areas, straight blade for legs and arms, and a floating foil to grab any leftover hairs that you may have missed! We like that it’s all in one, making it great for traveling. No need to pack a whole kit! Just charge it before leaving, toss it in your bag, and go! It works wet or dry, making it perfect for people with sensitive skin or for quick shaving on the go. We also like that it uses a USB cord to charge it, so you can charge it with your phone charging adapter, USB port on your laptop, or anywhere you can find an open USB port! Last up is another of our picks for the best electric bikini shaver. In fact, it’s made especially to handle the delicate bikini area! This trimmer from Philips is small and narrow, making it perfect for use on the bikini line to get a smooth shave every time. It’s cordless and runs on batteries, so no worries about wrangling charging cables! It works wet and dry, so you can use it however you feel most comfortable, which is especially important when dealing with such a delicate and sensitive area. It comes with 2 different length combs to trim longer hair or maintain your bikini area, a mini shaving head to get areas super smooth, a cleaning brush, and a handy pouch to keep everything organized. Even though this is mainly meant for bikini areas, we also think this would be a great trimmer to travel with or use it to touch up areas you missed when shaving legs or underarms! 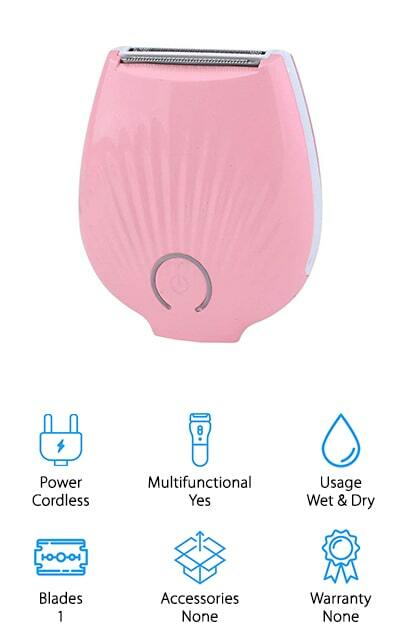 Our hunt for the best electric shaver for bikini areas led us to this compact electric shaver from Earthen Beauty. We like the compact design of this shaver, with its small body that can fit securely in the palm of your hand. This makes it much easier to control the shaver in tough to reach places, like the bikini line, behind knees, and more. It has both trimmer and shaver blades in one, so you can trim longer hair before shaving shorter hairs smooth. This electric shaver isn’t only for the bikini area, either – it’s perfect for using anywhere on your body, from legs to arms, underarms, back, and hands. You can use this in wet or dry conditions, which is great if you have sensitive skin or need to use it in a hurry in the morning! We think this is a great electric shaver to take with you while traveling because it’s so small and easy to use! If you have sensitive skin, you may think that electric razors are too harsh for your skin – but no worries! We highly recommend this razor from Philips as the best electric razor for a close shave, even if you have sensitive skin! This rechargeable, cordless shaver uses floating blades to get a close shave around tough curves and corners without irritation or nicks. We also like that the trimmers have rounded pearl tips, so they glide over your skin rather than dragging or scraping the skin. You can also use this in the shower or outside the shower with shaving gel to reduce irritation and prevent ingrown hairs. It’s also easy to clean the blades to keep them sanitary and free of bacteria. It comes with a few different trimming guides to give you more control in sensitive areas like your bikini line. Oh, and it all comes in a convenient pouch you can take with you when you travel!